Locals of this bayside playground will already know that some things are just uniquely St Kilda. The precinct is home to an eclectic mix of young and old and a melting pot of culture. We’ve told you all about the countless places to eat, drink and be entertained in St Kilda but behind the excitement of Acland and Fitzroy Streets is a whole host of treasures waiting to be uncovered. Here is our list of our favourite places and activities that give St Kilda that extra, unmistakable charm. The most creative way to get around in St Kilda is by old-fashioned rickshaw. 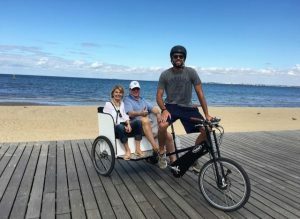 At St Kilda Rickshaws, a cheerful team of colourful personalities are ready to take you where you need to be on a scenic ride along the roads, bike trails and foreshore of St Kilda. It’s fun, safe and totally carbon-free! St Kilda Ink has grown into an icon of the St Kilda landscape, adding a pop of colour to the skin of many locals and outsiders alike. The colourful and quirky interior combined with the friendliest and most talented of artists makes for a comfortable environment that many of St Kilda’s ink addicts can attest to! There’s plenty of opportunity to pick up some pre-loved goodies in St Kilda. Frocks and Slacks has been perched on Barkly Street for years, amassing a collection of vintage clothing from around the world, on sale to trendsetters of St Kilda. Scout House is a truly unique institution of the precinct. The eclectic home wares store breathes new life into vintage pieces and draws inspiration from anywhere from flea markets to international trade fairs. The result is a wonderful collection of classics furniture, ornaments and knick-knacks. After you’ve found the perfect vintage frock to throw on on a night out, don’t forget that there are plenty of places to get your ‘do looking just right. Oliver’s Barbers is a cost, much-loved barber shop providing friendly service, while The Do and Yoshiko are a couple of stylish salons with clientele coming from far and wide to experience the best in beauty from the salons’ highly talented teams. 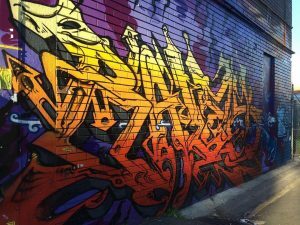 Melbourne’s laneways are well-known for their impressive street art, but it is a little known secret that the splashes of colour extend much further than the CBD. There are a number of murals and works of art covering walls and alleys in St Kilda, painted by talented and creative street artists. 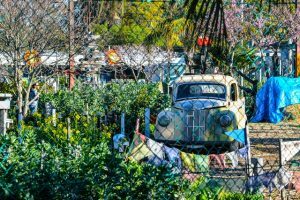 If you look hard enough, a pop of colour can be found on walls from the Peanut Farm Reserve to Acland Street and the side streets surrounding Inkerman and Chapel Streets. The main attraction for street art lovers in St Kilda is the iconic mural on the outer wall of popular bar Iddy Biddy on Blessington Street, which features a number of colourful characters, including an artist’s interpretation of the Luna Park ‘Big Mouth’. Whether it’s getting around, dressing up or inking up, it pays to pop in to the small boutique shops that line the streets of St Kilda to experience its unique appeal.